They also serve as Air Traffic Controllers for helicopters and fixed-wing supersonic jet aircraft. OS Sailors serve as watch supervisors and section leaders; interpret and evaluate presentations and tactical situations and make recommendations to supervisors during watch conditions. They apply a thorough knowledge of doctrine and procedures applicable to CIC operations contained in U. S. Navy Instructions and Allied or U.S. Navy Publications and procedures necessary for radar navigation contained in Naval Oceanographic Office publications. OSs provide to the command technical information and assistance related to Anti-Surface Warfare, Anti-Air Warfare, Anti-Submarine Warfare, Amphibious Warfare, Mine Warfare, Naval Gunfire Support, and search and rescue operations, and other matters pertaining to the Operations Specialist's area. Operations Specialists usually work in a clean, air-conditioned electronic equipment space or computer room, and frequently perform their work as part of a team, but may work on individual projects. Their work is mostly mental analysis and problem-solving. USN OSs are stationed primarily aboard USN deploying ships, FTS OSs are stationed aboard Naval Reserve Force (NRF) ships that deploy or conduct local operations. 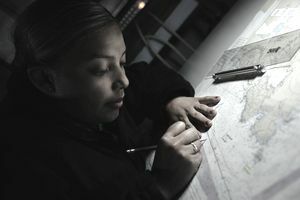 Upon completion of the course, OSs will be able to plot a ship's position, heading, and speed; operate common marine electronic navigation instruments including radar systems, and provide target plotting data to the combat information center based on information received from target tracking devices. Since Navy programs and courses are revised at times, the information contained on this rating card is subject to change.